Plants and microorganisms affect the substrates in which they grow in many ways. If you start growing plants in an inert substrate - with nutrient applications of course - you will notice that the substrate's chemical composition will start to change with time and it will start to get enriched in carbon containing substances. As plants and microorganisms grow, thrive and die, some of the chemicals that made up their cells end up enriching the substrate they grow on. This process - whereby organic materials from living organisms become part of a substrate - is what generates the soils around us. One of the most prevalent class of components in this organic material, is what we call humic acids. Humic acid is not a single substance but a wide range of substances that are created as a product of plant and microorganism decomposition. This is why you often hear people talk about "humic acids" instead of simply "humic acid". They are called "acids" because the humic substances contain molecules that have groups that resemble those found in phenol and vinegar. They are also differentiated from fulvic acids in the fact that they are only soluble at basic pH values while fulvic acids are generally small enough molecules to be soluble across most of the pH spectrum. Since humic acids are a very important component of enriched soils and can be used in soiless culture, people have started using them as supplements in soiless and pure hydroponic culture. When talking about the effects of humic acids it is worth mentioning that since we're talking about a group of molecules - not a single substance - effects are generally dependent on the source of the humic acid used. For example you can find a study on tomatoes here where two different sources of humic acids - from peat and leonardite - were used to grow tomatoes. 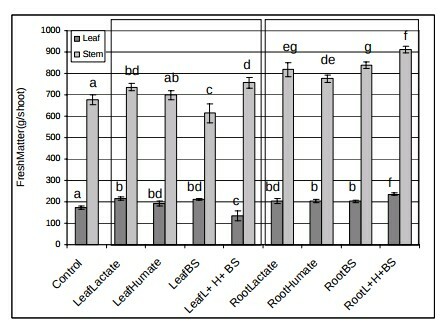 The study shows a clear difference between both with the first only stimulating root growth while the second stimulated both roots and shoots. However in both cases there was an increased iron availability to plants, although the mechanism for this was not established. In plants like gerberas humic acids applied at 1000 ppm can offer increases in harvested flowers of up to 52% (see here), somewhat positive effects can also be seen in tomatoes across the literature with most studies showing increases in yields and mineral contents (see here), reports of positive effects on gladiolus have also been published (here). Since the 1990s there has been a somewhat established understanding of some general beneficial effects for humic acid applications, it is well established that they can prevent and eliminate micro nutrient deficiencies due to their abilities to increase their availability(see here). The literature is also quite consistent in that the largest effects are often seen on root growth rather than on shoot growth or mass. There are however some types of humic acids that have showed higher increases of shoot mass, for example in an article studying humic substances derived from municipal waste on barley this was the observed effect. For some plants however - despite these beneficial effects - increases in yields in hydroponic culture are not evident (see here and here). A look at the effect of a humic acid source on several different plant species can be found here. Effect of humic acid, bacteria and lactate applications on tomato plants. It is worth noting that humic acid applications are also not limited to the root zone. Since humic acids can enhance the absorption of some nutrients they can also be applied in foliar sprays. Experiments on strawberries (here) showed that an application of 1.5-3ppm of humic acids led to an increase in the quantitative and qualitative properties of the fruits. Combinations of humic acids with other biostimulants are also common. For example a combinations of lactate, humate and beneficial bacteria was tested on tomatoes (here) but the experiments showed that the effect could be stimulating or inhibiting depending on the particular conditions, even though most combinations were beneficial. With the high variability between humic substance origins, application rates and effects it is very hard to say whether humic acid applications will definitely help your crops in terms of yields. For almost all humic acid sources it is probably warranted that micronutrient absorption will be somewhat augmented due to their ability to chelate these nutrients, but only if the nutrients are not efficiently chelated already. This sole ability might lead to crop improvements if deficiencies are present but improvements in yields will strongly depend on humic acid substance origin and particular properties. However humic acids do seem to lead to general product quality improvements and since negative effects are rare there seems to be no harm in carrying out field tests to determine if their use is worth it for your particular crop.